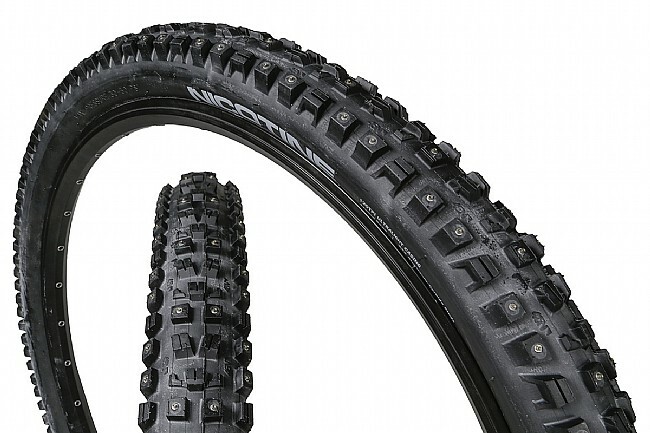 The 45Nrth Nicotine Studded 29 Inch Tire sticks your bike to the ground in snowy and icy conditions. This high-volume tire lets you better stay afloat on winter terrain while simultaneously providing a wider contact patch for the generously-spaced and siped lugs that grip and shed snow for lasting performance. To further your traction in the most extreme conditions, 222 aluminum-carbide studs are inserted across the tire with concave tips that provide a sharp attack angle that only gets sharper with wear. 29 x 2.35”. Folding bead. 120 TPI casing. Concave Aluminum Carbide spikes.